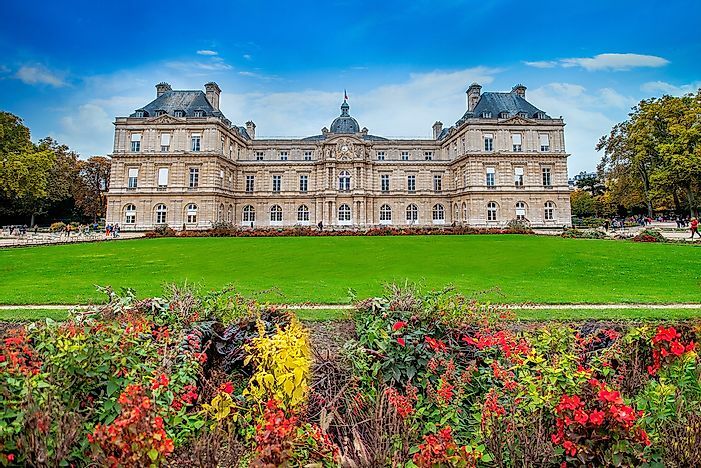 The Luxembourg Palace is a famous architectural building that is located in the 6th arrondissement of Paris. Luxembourg Palace is a notable building in Paris. The Luxembourg Palace, known as Palais du Luxembourg, is situated at 15 rue de Vaugirard in the 6th arrondissement of Paris. Originally, the palace was constructed according to the designs of Salomon de Brosse, a French architect; the palace was meant to be the royal palace for the mother of Louis XIII of France, the regent Marie de' Medici. The palace was built between the years of 1615 and 1645. Following the French Revolution, the palace was refashioned and transformed into a legislative building by another great French architect Jean Chalgrin between 1799 and 1805. The palace was yet again remodeled and subsequently enlarged by Alphonse de Gisors between 1835 and 1856.The Luxembourg Palace has been the French Senate's seat of the Fifth Republic since 1958. Following the demise of King Henry IV, the first French monarch of the House of Bourbon on May 14th, 1610, his widow Marie de Médicis became the regent to her son, Louis XIII. Marie had subscribed to a more powerful position, and with her newly acquired post, she authorized the construction of a new palace for herself next to an old hôtel particulier that was owned by the Duc de Piney who was known as François de Luxembourg. At present, the hôtel particulier, now known as Petit Luxembourg, is the place of residence for the president of the French Senate. With the desire to own a palace similar to her native Palazzo Pitti in Florence, Marie de Médicis gave Métezeau the task of going to Florence to make detailed drawings of Palazzo Pitti. In 1612, Marie de Médicis purchased the Hôtel de Luxembourg together with its relatively comprehensive domain commissioning for the construction of her palace which she referred to as her Palais Médicis. The construction of the palace began in 1615 and was completed 30 years later in 1645. The palace was transformed into a legislative building by Jean Chalgrin a French architect from 1799 to 1805. The grand central staircase was demolished and in its place a Senate chamber was established on the first floor, destroying and incorporating the chapel of Marie de Medicis located on the garden side of corps de logis. The French architect went further to make room for a library by enclosing the flanking terraces. During another remodeling process by Alphonse de Gisors, a new Garden Wing was added parallel to corps de logis. Inspired by the Galerie d'Apollon of the Louvre, the architect was responsible for creating the highly decorated Salle des Conférences. During and after its construction, the palace was passed down from one family member to another before becoming a museum in 1750. As a museum, the palace was the Louvre's forerunner, opening for only two days a week until 1779. A year before the museum was closed, Louis XVI gave his brother the Comte de Provence the palace. Afterward, the Luxembourg Palace was used as a prison for a brief moment as well as the seat of the French Directory during the French Revolution. In the year 1799, the palace was the home of the Sénat conservateur. As First Consul of the French Republic, Luxembourg Palace became Napoleon Bonaparte's first place of residence. Luxembourg Palace was the venue for the Paris Peace Conference talks from July 29th to October 15th, 1946.